FANTASTIC MONSTERS ATTACK EARTH! It Came from the Desert and you’ve never seen anything like them! A horror horde of crawl and crush clawing out of the earth from desert caves, “they’re coming and we must leave!” Kill one and two take its place! An Endless Terror! A Nameless Horror! A retro Sci-Fi Classic for the modern age. The government is testing in the desert once again. Project “Them” is a defense project mixing alien ant DNA and tarantula DNA together with the intent to save lives. Who would have ever thought that something could go wrong? Now these Alien Spider-Ants are loose and dwellers of the desert are dying. Saving the world and the girl just fell on the shoulders of two totally Rad dirt bikers who must eradicate these six legged freaks. This Bill and Ted tag team of Brian (Harry Lister Smith) and Lukas (Alex Mills) are about to embark on an excellent adventure they’re worthy of. 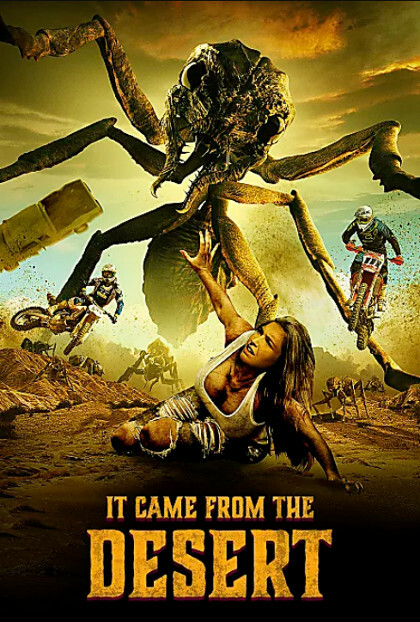 Dirt Bikers vs Giant Ants, who will survive! Finland’s film industry just copied America’s classic 1950’s monster movies into their own English language film. Marko Mäkilaakso helms this retro science fiction feature based on the Amiga, PC and TurboGrafx-16 game. The film has too much fun to be considered anything worthy of SyFy. Characters are over-the-top delivering excellent one-liner dialogue. The heavily CGI effects are by no means perfect but they look far better than American television fare showing passion behind the project. This CGI is equally as entertaining as films of the 50’s with their up close shots of “giant” ants. I believe some scale shooting was used in this modern day adaptation paying homage as well.